“I can not explain how excited we are to make the next step with the Meyer team. They are a family company and we are a family company, stated Strassweg. We are going to tell every small business owner from high-performance trucks and cars to Jeeps, RV and outdoor enthusiasts that they need to make Meyer Distributing a part of their business plan as we have, ” Strassweg elaborated. 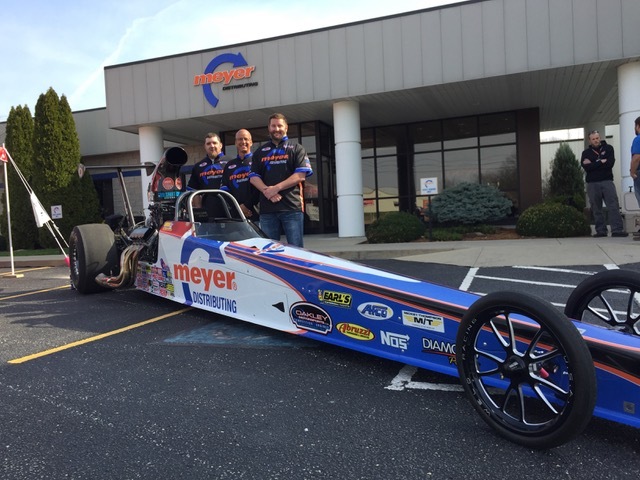 The Meyer Top Dragster will make its racetrack debut at the Four-Wide Nationals at zMAX Dragway in Charlotte, North Carolina. Prior to that, Strassweg will be at the Meyer Distributing HighPerformance Open House at their headquarters in Jasper, Indiana on April 6th. Success is nothing new to Meyer nor Strassweg, as Strassweg is focused on continuing the success on the track as Meyer is focused on continuing success being named top warehouse distributor by SEMA in 2017. Learn more about MEYER Distributing.